Supercomputer Sheds Weight, Gains Mobility, Becomes 'Server-on-the-Go. Launching 4kg Tornado F7 Server Edition with 8cores/16threads CPU, up to 22TB of storage and 128GB of memory. The Tornado F7 Server Edition is the newest, all-in-one, laptop based mobile server platform from Eurocom for “Server on-the Go” deployment. Powered by server-class Intel C246 chipset, this mobile server weighs 4.14 kg (9.1 lbs), making it much easier to move around compared to heavier, traditional tower and rack-mounted servers. 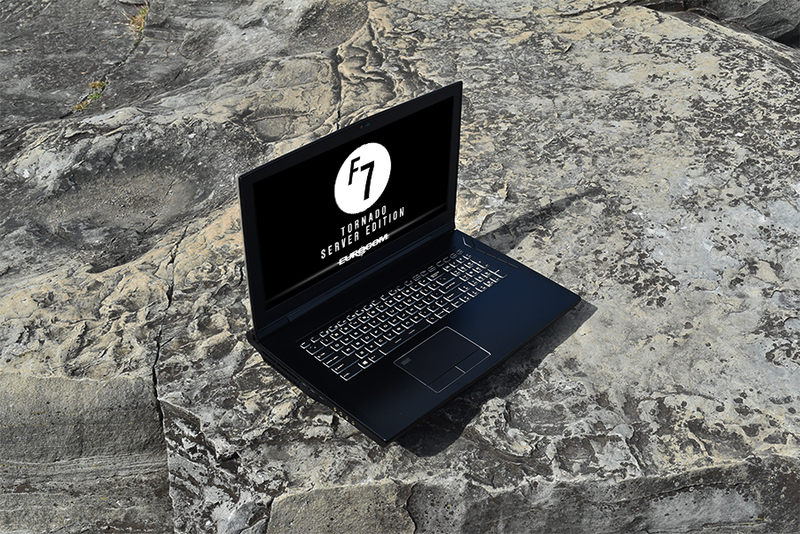 A lightweight, laptop form factor design allows the Tornado F7 Server Edition to be deployed virtually anywhere and can run multiple VM’s smoothly despite being on-the-go, and/or in a temporary location. The Tornado F7 Server Edition is “Ready-to-Go” right out of the box when preloaded and reconfigured with proper operating system(s) and applications. The Tornado F7 Server Edition has an all-in-one design complete with integrated display, keyboard and built-in battery/ UPS making it very portable and easy to move around. Consuming under 230 Watts, the Tornado F7 SE has low power usage and is very energy efficient. Using Intel’s server-class C246 chipset allows the Tornado F7 Server Edition to support a variety of LGA1151 socket based XEON class processors 6core/12threads, such as the XEON E-2186G and next generation of XEON CPU’s with 8cores/16threads or more in the future. Tornado F7 Mobile Server also supports a line of LGA1151 based i9 processors that are currently available with 8cores and 16threads. The standard LGA 1151 CPU socket technology allows for the Tornado F7 SE to be upgraded as newer CPU’s come out, giving the Tornado F7 Server Edition scalability into the future. The Xeon CPUs consumes up to 95 watts of power, making this mobile server form factor a very energy efficient alternative to traditional tower and/or rack-mounted servers. The Tornado F7 SE supports up to 128 GB of DDR4 RAM (ECC and non-ECC memory). It is capable of running multiple VM environments simultaneously using up to 4 x SODIMM sockets of 260-pin, DDR4 memory modules. These modules are low power, running at 1.2 Volts of energy per module, further adding to the Tornado F7 SE’s high energy efficiency. The Tornado F7 Server Edition supports 5 physical drives (3x M.2 NVMe and 2x 2.5" SATA3), providing up to 22TB of storage. The five drives can be configured in multiple RAID options depending on user requirements. The RAID 0/1/5 options are available for NVMe SSDs and RAID 0/1/5/10 options are available, when all 5 drives (both NVMe and SATA3) are utilized. The Tornado F7 Server comes with an integrated Intel L219 LAN chipset, VPro-based, running at 1 GbE with a standard RJ-45 port. This LAN port is ergonomically located at the back of the machine, away from other ports, to reduce disruptions from other ports/wires and allows for non-stop network connectivity. Additional LAN ports are available via Thunderbolt 3.0 docking station. Designed to be “Ready-to-Go” out of the box, the Tornado F7 SE comes preloaded from a choice of operating systems including VMware, Microsoft Server 2016, MS Server 2016 Data Center Edition and Linux, just to name a few, depending on the client’s specifications. This makes it very easy for IT professionals to deploy virtual and non-virtual environments at a reduced timeframe compared to traditional tower and rack-mounted servers. The Tornado F7 Server Edition comes with an internal Smart Li-Ion battery that functions as a built in UPS, giving it about 2 hours of uninterrupted power, allowing for proper shutdown in the event of a power failure. In order to run cool and to keep internal temperatures low in the Tornado F7 SE, Eurocom uses an external power supply to generate less heat compared to traditional rack mounted servers with internal power supplies built-in. By removing the internal power supply, Eurocom has provided longer lasting server hardware infrastructure by reducing the risk of potential overheating. Adding to its already impressive thermal output, the Tornado F7 SE has 2 fans embedded along with 3 total heat sinks to maintain an even heat dissipation and keep overall heat production and energy use low. Large vents are strategically placed in the back of the machine to give this Mobile Server form factor not only more of a sleek and stylish look, but also adds great functionality as it allows for more heat ventilation. There are also internal thermal sensors monitoring internal temperatures in an ongoing basis. Eurocom offers a complete suite of security in its Tornado F7 Server Edition including a SmartCard Reader, TPM 2.0 Encryption, Fingerprint Scanner, BIOS Disk Encryption and Kensington Security slot to allow customer to protect and secure their data and/or intellectual assets. Eurocom also offers an optional, “anti-hacking protection suite,” consisting of the removal of webcam, microphone and WLAN. This allows for protection of intellectual assets and further defends against malware, tampering and theft of digital assets, data and other intellectual properties. Network administrators and other IT professionals benefit greatly from utilizing the Tornado F7 SE within their server environment because like most Eurocom systems, the Tornado F7 SE can be preconfigured even before it is shipped to the client. Local Network Manager simply has to plug in the Mobile Server at the client site and the server/VM is deployed immediately with little to no downtime. Whether it is for disaster prevention/recovery, redundancy, server or VM migration, the Tornado F7 is perfect for IT Managers who are looking to innovate their IT infrastructure, reduce bottlenecks and ultimately move away from the limitations of a traditional tower or rack-mounted server. Major industries such as Aerospace, Military, Emergency Response firms, database developers, and many more Engineers and IT professionals requiring urgent server capabilities is the target demographic for the Tornado F7 SE. However, start-ups and other small to medium-sized businesses can also benefit from Eurocom mobile servers as it allows them to set up data centers and/or VM environments in temporary locations where the luxury of extensive wiring is not accessible or present. Professionals working with and running multiple VM’s within their infrastructure can also take advantage of the Tornado F7 SE’s capabilities in order to seamlessly run, test and modify many different applications and VM’s simultaneously. 11. Chassis: Heavy-duty, mechanical design via combination of aluminum alloy and German-manufactured resins. After 20 years of developing Mobile Servers, Eurocom continues this tradition by providing tools that give engineers, architects, developers and other digital content creators the ability to seamlessly run operating systems like: VMware, Windows Server 2016 Data Center Edition, Windows 10, Linux- just to name a few. The Tornado F7 Server Edition offers power users and engineers the performance, capabilities and portability of a laptop form factor without sacrificing the power and performance of a much bulkier, less energy efficient Tower or Rack-mounted server.